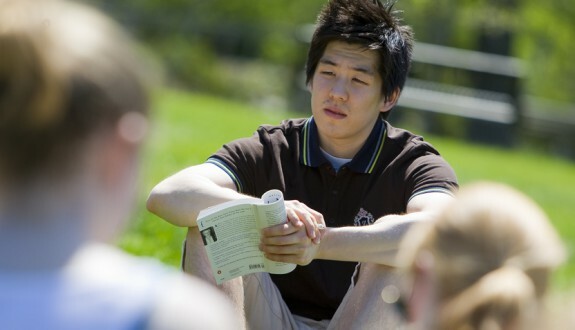 Stonehill students are individuals who crave moral, spiritual, intellectual and social growth. Leading with courage and compassion, they combine rigorous academic inquiry and cooperative learning with personal responsibility and the will to act. Each student has a unique background and we want to put your academic record into the proper context. The following factors are the primary focus of our consideration. All students applying for undergraduate admission must submit a completed Common Application. Candidates for admission must also submit an official high school transcript, a completed secondary school report or counselor recommendation, and one teacher evaluation. The submission of standardized test scores (SAT or ACT) is optional. Part of our review will include the courses you have taken in each subject area within the context of what your high school offers. The curriculum must meet both the general requirements of a college preparatory program and the particular requirements of Stonehill College. Most successful applicants have prepared for the rigors of Stonehill by taking a demanding college preparatory program in high school including: 4 units of English; 4 units of mathematics; 3 units of science; 3 units of foreign language; and 4 combined units of history, political science and social sciences. In addition to these units, 2 academic elective subjects should be taken. A student's application cannot be acted upon until the Committee on Admission receives an official high school transcript including course grades for grade 9, grade 10 and grade 11 for early action and early decision candidates. Course grades from first semester of grade 12 will be included in our review of applications from regular decision candidates. Stonehill College is test optional in the application review process. Students are encouraged to submit SAT or ACT scores if they believe the scores will benefit their application for admission. However, test scores are not required. The Stonehill College code numbers are 3770 (SAT) and 1918 (ACT). For more information on average SAT and ACT scores for successful candidates for admission, please see the Student Profile section below. Most applicants to Stonehill are reviewed and admitted with no regard for financial aid filing status or calculated need. However, due to the limitation of financial resources and competitive nature of our awards, a first-year applicant’s eligibility for aid may be considered in the admission process for a small portion of our candidates. *Stonehill is test-optional in the review for admission and merit scholarships. The test ranges above reflect the 88% of the Class 2022 who reported their scores to the Office of Undergraduate Admission. Take the first step to becoming part of the Stonehill community. Apply today! Explore our welcoming campus to find out if Stonehill is the right fit for you. Plan a visit! Tell us a little bit about yourself and we’ll keep you up to date with news and information. Sign up now!